Fishing Atlantic salmon is not like catching trout. A trout will feed day or night and when it so desires, whereas the Atlantic salmon, has come from the ocean strong and fat. The male joins up with the female not to feed but to spawn and create more future salmon. A place is selected in the river and becomes there nesting area. The Atlantic salmon does not strike at the fly thinking it is food, but rather is attacking, thus protecting the female and the nest. He also strikes at thefly as it becomes an irritant to him. Most of the time the fish will be resting out of sight in deep water and at certain times of the day, usually in mourning before noon and later in the day at late afternoon, just before the sun sets they become stirred. The salmon will showitself in a jump or tailing effect in the current or even in the oxygenated foaming waters. They get on the move so to speak. It is at this moment that they can more surely be attracted to the fly and be caught. Atlantic salmon is an oceanic fish from the Salmonidae family. It averages about 12 pounds and has cross-shaped or round spots on the top and sides. The fish can be found on both sides of the ocean (the one above entered from the Pacific Ocean). They enter the rivers in the fall and migrate upstream to spawn. After spawning, the kelts (adult fish) may leave the nesting area and return to the ocean to spawn again. The young ones mature and in about two years depending on growth, head downstream to the ocean. They return to the river and repeat the spawning cycle. If you're interested in a angling challenge including salmon fishing and would like further information about the lodges (Alto Puelo Lodge on the Argentina and Chile border, Rio Yelcho Lodge in Chile and the Alerces Park Lodge in Argentina) contact us today. 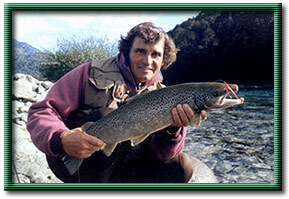 Experience the Andes Mountains, the good food and the great fly fishing. Contact us today for more information.